Icon Research announced the launch of the new DK-20 Diesel Doctor instrument and version 6 engine analysis software. 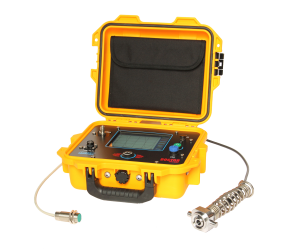 The updated DK-20 has been built to be even more portable, rugged, easy to use and accurate with new features such as a touch-screen and built-in test. The V6 software is even easier to use and features improved reporting capabilities and offers additional analysis features such as propeller curves and shop/sea trial comparisons. Compared to the previous instrument (DK-2), the new DK-20 is smaller, lighter, smarter, easier to use and takes more accurate readings than its predecessor, according to its developers. The new version 6 software is a complete rewrite and is fully compatible with Windows XP, Windows 7 and Windows 8. Although the same general feel of the previous generation of software has been maintained, many enhancements have been included to improve ease of use. The Diagnostic Reporter has been improved such that engine analysis reports can be viewed instantaneously. The ability to compare and analyze propeller curves and shop/sea trial data is now also possible. Existing DK-2 based systems can be upgraded to work with the new version 6 software. The Diesel Doctor allows users to see exactly how engines are performing and take action to ensure reliable, efficient operation and avoid the unexpected. By ensuring engines are well balanced, users can expect fuel savings. With regular engine tests, trends in engine performance can be observed and predicted. Diesel Doctor helps minimize damage due to developing faults and replace parts only when they need to be replaced. And as maintenance requirements are reduced, so is the crew's workload. The Diesel Doctor provides automatic engine reports saving analysis time and reducing paperwork. It also doubles as a valuable training aid for inexperienced engineers.